Lindsay and Jimmy met 13 years ago as she was friends with his sister. They would meet again later in life when their paths crossed again. After 4 ½ years together he knew he wanted to be with her for the rest of his life, and he proposed. 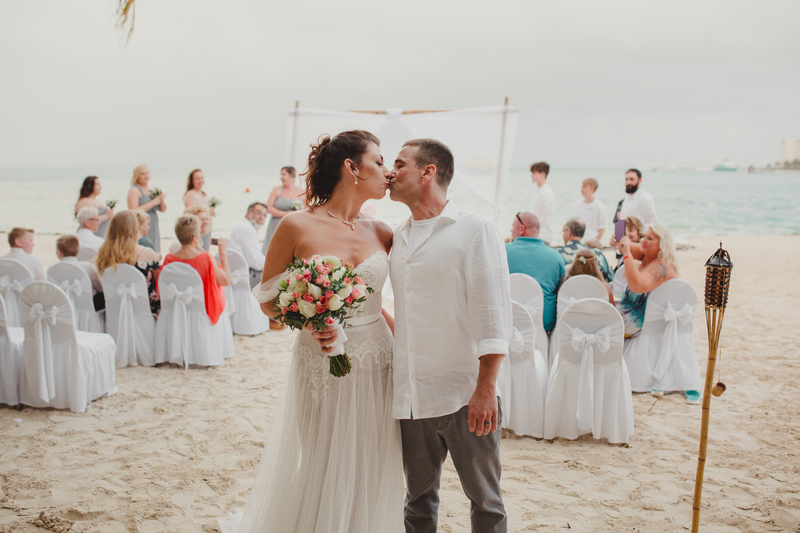 They decided on a destination wedding because they wanted it to be small with just close friends and family, plus she had always wanted a beach wedding. Together with their Destify agent, Steve, they coordinated a wedding party of 25 guests. They chose the Occidental Resort in Cancun because it was directly on the beach. Lindsay loved the size of the resort and said, “I wanted people to be able to interact.” The lobby and pool were close together, so they could run into a guest at any given point. After an initial rough start with the original wedding coordinator, she was put into contact with a new representative. After a bit of panic and miscommunication, the representative was able to take care of all of her questions via email. Once on-site she received a new coordinator from a sister resort and everything went well. On Thursday they were able to host a rehearsal dinner at one of the resort’s restaurants. The morning of the big day Lindsay and Jimmy had breakfast together and split up around 1 pm to get ready for their groomsmen and bridesmaids. They took pictures as they were all getting ready and then proceeded to the ceremony. The ceremony was postponed for 10 minutes during a brief rain shower. They moved the reception indoors as it was still very windy and rainy. Although the reception was moved, the new ballroom location provided a stage and wedding decor. Beyond the wedding, the couple got more time with family and friends, and after that, alone as a couple. They loved that the resort was close to the ferry and they got to explore Playa Mujeres and more of the Riviera Maya. Lindsay says her best advice is to take your time making decisions and choosing your resort. The couple was able to get a complimentary room upgrade which they loved. The resort took care of them leaving special decorations in the room and offering outstanding service during the reception. With my package we were upgraded to the Junior Suite, it was awesome, and the hotel did things like put flowers on our bed the night of our wedding.